Michael J. Novosel was only 19 when Pearl Harbor was attacked. Determined to fly for the Army Air Corps, he was too short to pass the flight medical. His friends carried him around on a stretcher for several days in the mistaken belief that he might grow a little if spared the effects of gravity. It didn’t work. But a flight surgeon, swayed by Mike’s patriotism and enthusiasm, fibbed on Mike’s physical so long as he promised to grow another quarter inch. Mike flew bombers over the Pacific during World War II, eventually commanding a B-29 squadron on the island of Tinian before he’d even earned a drivers license. He carried two cushions, sitting on one in order to see over the instrument panel and placing the other behind him in order to reach the pedals. He participated in the bombings of Tokyo, and later flew over the surrender ceremony on the Missouri. After Korea, Mike was RIF’d out of the Air Force – a victim of peacetime supply and demand. He stayed active in the reserve, but focused on his growing family and a successful airline career. 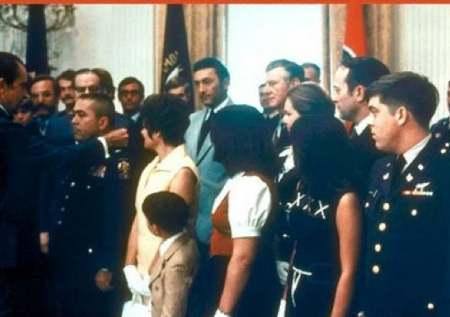 He was moved when JFK encouraged Americans to “ask not what your country can do for you…” And when Kennedy was assassinated, Mike watched as John Jr saluted his father’s caisson. The bravery of that three year-old – the same age as Mike’s youngest son, also named John – convinced him to request a return to active duty. The Vietnam war was heating up, and Mike couldn’t sit idly by while others risked their lives. But the Air Force determined that Mike, at 43, was too old to fly. Undaunted, Mike asked the Army if they could use someone with his experience. They welcomed him with open arms – and a paycut. Joining the army meant resigning his Lieutenant Colonel commission (and pension) in the Air Force. He would have to enter as a warrant officer – the same grade as guys half his age. After brushing up on helicopter flying, Mike was sent to Vietnam and joined a new unit known as Dustoff. Before Dustoff, wounded men were treated in the field – less than ideal conditions for a traumatic amputation or a sucking chest wound. Dustoff’s Hueys fanned out across Vietnam and rescued seriously injured soldiers and civilians – both allies and enemies – resulting in a 97% survival rate for the 900,000 who were saved. Flying these Huey’s was unbelievably harrowing. Crews’ only protection from constant hostile fire was a quarter-inch thick, plexiglass windscreen and aircraft skin the same thickness as a soda can’s. They had little armor and no weapons. Strapped in tight, they had no way to duck or dodge incoming fire. 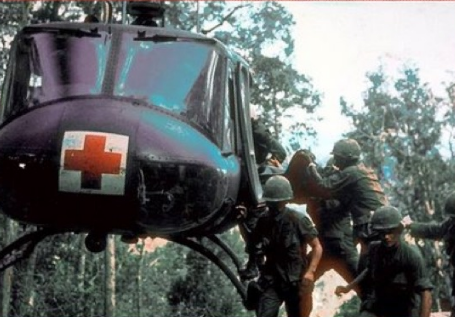 Their only defenses were their flying abilities and the efforts of the grunts who came to know the “whoop-whoop-whoop” of an incoming Huey as the sound of life. Mike distinguished himself as a pilot and a leader. He taught FNGs how to avoid being shot down and how to fly via instruments (not a part of helicopter training at the time.) Along the way, he also gained new perspective on the realities of war. He had gone from flying bombers high over a target to being in the thick of a brutal, bloody war – constantly being shot at, witnessing horrific injuries, hosing blood and body parts out of his Huey after each mission. The contrast could not have been greater. By then, Mike’s son Mike Jr had grown up, joined the army and become a pilot. As anyone who’s seen Saving Private Ryan knows, brothers can’t serve together. However, the army sensed a public relations opportunity in having father and son fly together – the first time in US aviation history. So Mike Jr joined his dad’s Dustoff unit in Vietnam. A father’s worst fears were realized when, several months later, Mike Jr was shot down (one of six times.) He was rescued, of course, by his father. A week later, Mike Sr was shot down and rescued by Mike Jr. In all, Mike Sr flew 2,543 missions and rescued 5,589 wounded. He was later awarded the Congressional Medal of Honor for flying fifteen times, without air cover, into an enemy training facility to rescue 29 South Vietnamese soldiers who were pinned down by enemy fire. When Mike retired in 1984 – from the Army this time – he was the last former World War II pilot still on active flying duty – the last Eagle. When I first met him, he didn’t strike me as much of a hawk as war heroes go. After getting to know him, I understood. Unlike many Americans whose perception of war is shaped by CNN or Fox – a puff of smoke, viewed from five miles high – Mike saw the victims’ faces, heard their screams and was soaked with their blood. As a result, he understood war was a last resort, when all else had failed. At the time of his retirement, Mike’s awards and decorations included The Medal of Honor, Distinguished Service Cross, Distinguished Flying Cross with two Oak Leaf Clusters, Bronze Star Medal with two Oak Leaf Clusters, Air Medal with “V” Device and 60 Oak Leaf Clusters and the Purple Heart Medal. He was proud to have been awarded the Medal of Honor for saving, rather than taking, lives. But, he considered his greatest awards the countless simple nods of thanks he received from men who would otherwise have died in battle. Mike Sr. passed away in 2006 after a tough fight with colon cancer. He was laid to rest a stone’s throw away from JFK at Arlington National Cemetery. Mike Jr. passed away in 2009, a few days after receiving his father’s Medal of Honor flag in a ceremony at his home in Florida. Those fortunate to have known them will miss their fearlessness, their compassion and their uncommon wisdom.